Our Bridged Mono Adapter is designed to take advantage of bridging your amp. Wired 1+, 2+ at the amp end and 1+,1- at the speaker end. Made with one NL4 (amp end) and one NLT4M (speaker end) so this can be used convert your existing cables to bridged mode. 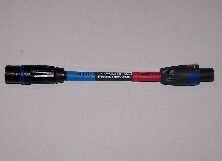 Will plug right into the end of your existing Speakon speaker cables. This is a great item to keep in your cable box. Please select cable length.